Mathematical functions are used for various mathematical operations – calculation of logarithm, exponentiation, etc. As an argument of mathematical functions, it is possible to use channels (the operations are performed with signals’ instant values), constants and equations. Natural logarithm (Ln) – calculation of argument’s natural logarithm (constant, channel, equation). Common logarithm (Lg) – calculation of argument’s common logarithm (constant, channel, equation). Exponent (Exp) – calculation of argument’s exponent (constant, channel, equation). The figure below shows an example of exponent’s natural and common logarithms calculation. For illustration purposes, there are used numerical values (constants). However, these operations are also applicable to channels (that are using instant signal values) and results of equations. The values of program Formula signals are measured by DC voltmeters since in this case mathematical equation results are represented by a constant. Squaring (Sqr) – calculation of argument’s square value. Square root (Sqrt) – calculation of argument’s square root. The figure below shows an example of squaring and square root calculation. 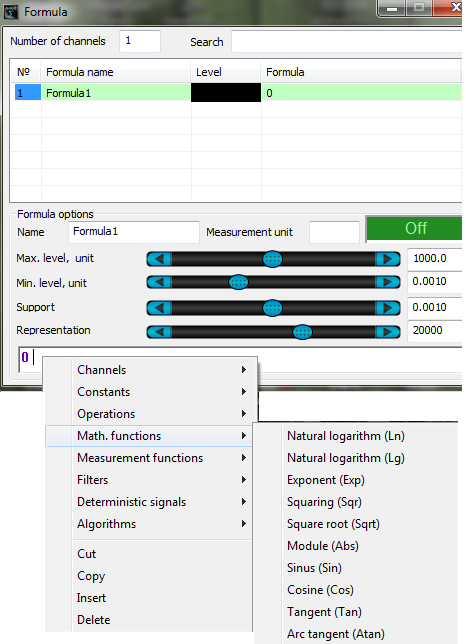 For illustration purposes, the operations are performed with numerical values (constants), however, these operations are also applicable to channels (instant signal values are used) and equations results. The values of program Formula channels are measured by DC voltmeter since in this example the result of the mathematical equation is represented by a constant. Sinus (Sin) – calculation of argument’s sinus value (the value is set in radians). Cosine (Cos) – calculation of argument’s cosine value (the value is set in radians). Tangent (Tan) – calculation of argument’s tangent value (the value is set in radians). Arctangent (Atan) – calculation of argument’s arctangent value (the value is set in radians). The figure below shows an example of sinus, cosine, and tangent values calculation in Formula program. 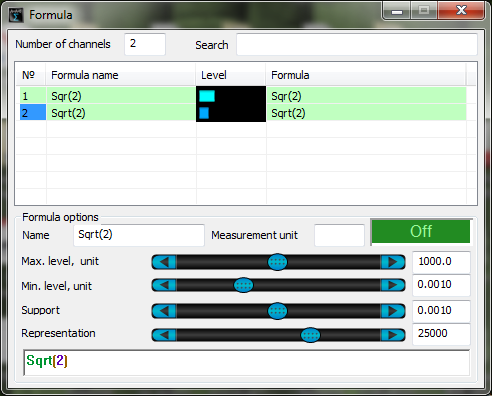 For illustrational purposes the operations are performed with numerical values (constants), however, these operatioты are also applicable to channel (instant signal values are used) and equation results. The values of program Formula channels are measured by DC voltmeter since in this example the result of the mathematical equation is represented by a constant.